Are you an affiliate marketer who wants to create a coupons and deals site? Do you want to know how to create coupon sites like Groupon, WPCouponCode or RetailMeNot? Well, then you have come to the right place. WordPress Themes to create a coupon site from scratch. WordPress Plugins to add coupons to an existing e-commerce or blog website. If you already have a source of coupons, then you are halfway through. If not, you may skip to the themes and/or plugins. Buy a short, branded domain name. Buy hosting for your website. (Note: Coupons niche easily attracts traffic. So It’s better to avoid shared hosting plans). Install WordPress on your website. Once you have the usual setup ready, you can then start collecting coupons for building your own coupon site. Affiliate networks like ShareASale, ClickJunction, and LinkShare provide an affiliate management system to all the major merchants in the world. For example, online e-learning marketplace Udemy.com manages their affiliates through LinkShare. Most of them provide a central facility that allows merchants to distribute coupons and deals to all the affiliates in their program. Some provide an active database for affiliates to use, some provide active feeds. All of them can be used for success of their affiliates. Coupilia has a 14-day free trial with a vast merchant coverage (over 25,000 merchants and 24 affiliate networks). CouponFeed has a simpler pricing structure with over 50 affiliate networks and more than 60 in-house affiliate programs. FMTC offers a power-packed data feed that is hand-verified by their team (so you know coupons will work!) and they provide a 30-day free trial too. Rakuten PopShops publishes online deals and coupons aggregated, cleansed, and audited from over 4000 retailers. Their pricing includes a 30-day free trial and monthly/half-yearly/annual plans for both – individuals and enterprises. Feeds4 has a non-nonsense data feed from 18 affiliate networks worldwide. They provide a 7-day trial without any credit card. Additionally, you may also want to check out similar services like iCodes (it’s a coupons and deals API) or PriceTapestry (a PHP and MySQL price comparison script). Let’s now discuss some to best strategies you can use to boost the success of your WordPress coupon site. Coupons should link directly to the actual product page, not the merchant homepage. If the coupon is for a category of products instead, link the category search page. Customize your site for high-value deals and target peak seasons. Promote new membership coupons for first-time buyers with budget constraints. Promote bulk order coupons to businesses, not to individuals. Corporates tend to buy items in bulk for their corporate programs. Promote related coupons together. When a user buys a battery-powered electronic item, it’s only natural he would be needing a power bank. If you combine offers for your users, you are adding a lot more value than what they came to your site for. Promote threshold coupons; they’re your money makers. If a visitor goes near the value of threshold coupon, you can display these threshold coupons as popups. If a combined purchase materializes, it puts more affiliate income in your pocket! The easiest way to start a coupon site using WordPress is to select a coupon theme. In this article, we are featuring a few high-rated coupon themes that have already been tried and tested. Merchants can list coupons with you and you can collect payment from them using the integrated payment system in this theme. Affiliate URL cloaking is a built-in feature of Clipper coupon theme. You can see the performance of your coupon pages with statistics like page views and click-through rate. You can create search pages for specific category or stores, using the built-in page templates in Clipper coupon theme. You can import coupon definitions from CSV files. What this theme lacks: You can’t import XML or JSON based coupon feeds. CouponXL is marketed as a complete WordPress theme for coupons and deals sites. You can source coupons in an XML or accept coupon submissions from merchants. CouponXL theme integrates Skrill, PayPal, and Stripe as payment options for user-submitted coupons. A membership functionality to add high-value, member-only coupons and deals. Mega menu for deep category-based browsing. Tag a coupon store with latitude and longitude of the location (where it can be used). CouponXL reads visitors’ locations and displays Geo-tagged coupons. On the outside, Koupon theme has all the customization features to help you build your dream coupon site for promoting your affiliate membership through coupons and deals. But it some exclusive features that you won’t find in any other coupon theme. Create the most stunning homepage slider for deals and coupons with the most advanced slider plugin called Revolution Slider. Show related coupons at the bottom of every coupon page to increase interlinking and allow the customer to save more money through multiple deals and coupons. Show coupons in Footer menu. Comre integrates a WooCommerce enabled web store for direct selling alongside affiliate coupons. You also get Visual Composer (drag-drop page builder) plugin for free (it costs $30 when purchased separately). CouponHut is an excellent mobile-optimized coupon and deals theme that prevents any visitor dropouts when your website is visited via mobile devices. With CouponHut, you can create online (WooCommerce enabled) stores along with coupons and deals offers too. What really makes CouponHut unique are advanced search filters for users to find their favorite deals within just a few clicks. Coupon Expiry Counter that enables you to use scarcity marketing to improve your CTR. You can also integrate a coupon plugin in your existing e-commerce site or a blog website to add support for coupons and deals. When you are choosing a WordPress coupon plugin for setting up a blog or a website, there are lot many factors to consider. For a non-technical user, all this can be overwhelming. An average user may not have time to devote to all the research, he simply wants to increase CTR to get more affiliate business. In this article, we present to you a list of coupon plugins that will help you add a full-functioning coupons and deals section to your regular website/blog so that you can leverage your existing traffic and get more affiliate business. Magic WP Coupons is more than just a basic coupon management plugin for WordPress websites. Not only you get 10 coupon box templates with WP Coupons Lite, you can also customize your coupon boxes by uploading your own templates. You can also cloak your affiliate URLs so that visitors don’t see a long, ugly URLs. Visitors can also like or dislike a coupon, or if they like it – there’s also social share buttons enabled on the coupon itself. In 4 simple steps, this plugin generates thousands of coupon codes for your WooCommerce enabled store. Although it doesn’t provide the complete coupon management functions, it’s a pretty simple plugin which you can use in combination with other coupon management plugins. When a genius idea is executed brilliantly, a product like Viral Coupon is born! The main idea behind this revolutionary coupon plugin is that users need the incentive to share your website. With Viral Coupon, you give a fixed percentage/fixed price discount (or other types of discount) only to those users who share your website on Facebook/Twitter/Google+. If a user shares your web store, they get a pre-configured discount on their cart value. The coupon code gets automatically generated and stored on the backend for you to manage. Viral Coupon even tracks if users have already shared your message, in order to limit discounts to one share per user. (A similar plugin is Coupon Popup, which doesn’t show the coupons to user until they click an [affiliate] link). We have only mentioned those coupon themes and plugins which provide a specific advantage to the user. A simple search on WordPress.org (for plugins) or any of the popular theme shops (for themes) should give you all the coupon plugins and themes released for WordPress. What hosting you recommend when starting with a coupon website? The site needs to super fast. Also, which coupon theme is the fastest to load? Hi Richard, Thanks for the comment. For a coupon site, you should try WPEngine as it’s fastest. Clipper is the best coupon theme to go. Let me know if you have some special requirements. Wow, such a great overview, I have noticed that more and more people are interested in affiliate marketing, that’s why we can easily explain their popularity growth! I am the RevGlue affiliate, and I can advise this type of marketing to each of you who works in the web design and development niche! It is easy to promote the best templates on the net and to earn 80% commission! Ready to share my experience! I personally love Coupons websites because it generates more than any affiliate programs for pushing products. See How to Start a coupon website? 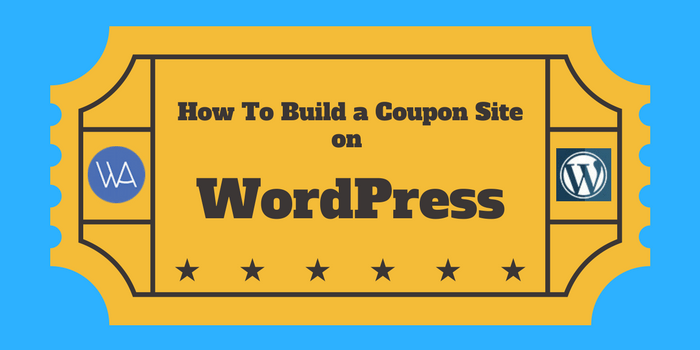 The article nicely explains “How to Build a Coupon Website using WordPress”. Try our WooCommerce Discount Rules PRO which Creates Dynamic Pricing and Discounts in your WooCommerce online store easily. Bulk discounts, cart discounts, special offers, user role-based discounts and more. One can also add price comparison feature in their coupon website which will give an extra edge It will also helps in attracting more customers. Moreover for coupons they can use coupon API which are easily available in the market. Coupon API removes all the manual work of uploading the coupons. These are old and excellent plugins, but you need to add more new plugins to help the beginners.